Two prisoners serving life sentences for murder used power tools to drill through the steel walls of a maximum-security prison in northern New York State, close to the Canadian border. A massive manhunt is underway with over 200 police involved. 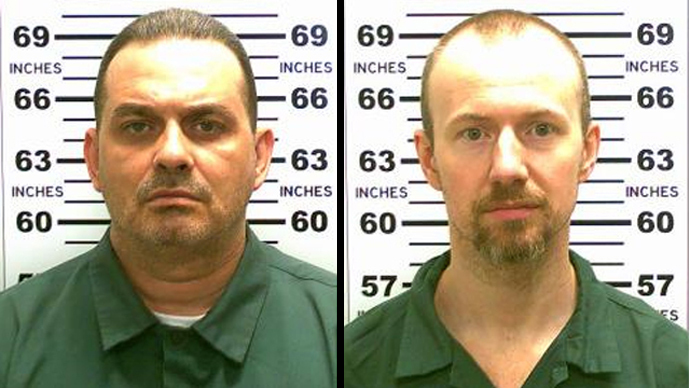 The prisoners, identified as Richard Matt, 48, and David Sweat, 34, used “an elaborate plot” to escape from the Clinton Correctional Facility in Dannemora, New York governor Andrew Cuomo said. They left a sticky note that read, “Have a nice day," CNN reported. The two convicts, who had adjoining cells, were discovered missing on Saturday morning during a bed check. The escapees were last seen at 10:30 p.m.
“A search revealed that there was a hole cut out of the back of the cell through which these inmates escaped,” acting state corrections commissioner Anthony Annuci said during a Saturday news conference. Officials have described the two convicts as “dangerous individuals” and instructed people not to approach them. It is still unclear where the inmates obtained the power tools for their well-planned escape. “They went onto a catwalk which is about six stories high. We estimate they climbed down and had power tools and were able to get out of this facility through tunnels, cutting away at several spots,” Anthony Annuci said. This was the facility’s first prison break from the maximum-security wing since 1865, Cuomo said during a press conference. A major security concern is that the Canadian border is only 32 kilometers (20 miles) from the prison. Police have set up road blocks and are using bloodhounds and aerial surveillance in their search. Matt is serving a sentence of 25 years to life for kidnapping a man and beating him to death in 1997. Sweat is serving life in prison without parole for first-degree murder of a Broome County sheriff’s deputy in 2002. Police described Matt as a 6-foot-tall white male with black hair and hazel eyes. Sweat is a 5-foot, 11-inch white male with brown hair and green eyes.